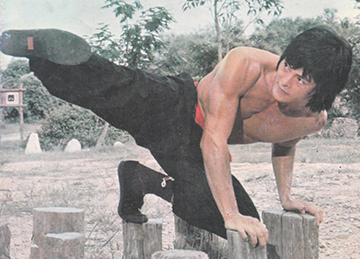 �Southern Hands, Northern Legs.� This old saying has bamboozled hordes of martial students to take for granted the superiority of hand striking for the Southern styles of Kung Fu and the dominance of kicking in the Northern styles. It is true that each of these styles have unique techniques in these categories but the North-South comparison really aims at skills that are not so obvious. Take the Northern styles first: they are renown for kicking skills. But beyond this they lean heavily on superb footwork such as leg locking, misleading maneuvering, leg checking and even lower limb Chin Na. Northern styles stretch your body to unusual angles trying to coax out every last inch of reach offering more surprise evasions, more counter-strikes and, in some cases, more unexpected twists and turns to deal with the single opponent or multiple attackers: another Northern specialty. A good Long Arm practitioner may stand at a safe distance and throw a flurry of exactly the sort of kicking you would expect, but when he finds himself in close and personal his legs transform entirely unleashing knee lifts, tight buckles and hard stomping attacks. I often tell my students that in Kung Fu things are not always what they seem, in fact more often than not your assumptions will prove as unreliable as combing your hair in a funhouse mirror. The ability to kick high, for example, is really more applicable to suddenly dropping low than anything else. Both actions� kicking and sinking�are the same stretch in much the same way, and in fighting you will rely on the sudden deceptive drop and disappear a lot more than you will the all-too-visible high kick. The story that what you see is only the surface of the technique in Kung Fu is precisely echoed in the Southern Boxing. Even someone with little training watching Wing Chun Pai would spot the obvious emphasis on fast and clever hand changes. 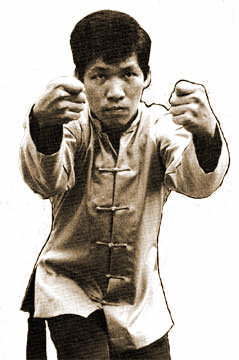 But as Wing Chun practitioners themselves point out the art is in the footwork. The formula may differ a bit but the goal is the same as for his Northern cousin. For instance, there�s a Wing Chun saying that, �To stop your opponent�s kicks, punch at his head.� This is actually good advice, but there�s a technical side to it. One thing for sure, it only works if you are in the perfect position and the relationship to the opponent is spot-on. The positioning of the feet becomes explicit with that head-stopping punch, supplying help from �down below.� Another common Southern maneuver to control an attacker�s kicks is to grab his arm and pull down to abort his weight shift. The power for this quick, explosive jerking action must originate in the soles of the feet. The hands are there for all to see but they are rendered effective only by those ghostly steps and secret shifts. What does all this mean? That no matter the style Kung Fu is always a whole body activity; a style is just a curriculum, a way to organize your journey toward mastery of hands, legs and heart. Posted December 10, 2011 by Ted Mancuso. Comments and trackbacks are open. Follow the comments feed. Tagged with: Cha Chan, Gung Fu, Hung Gar, kung fu, Northern Kung Fu, Pak Mei, Piqua, Praying Mantis, Shaolin, Sother Kung Fu, Tong Bei, White Eyebrow, Wing Chun. Things I am discovering right now in my sparring. As a northern stylist, I could not agree with Mr. Mancuso more. HOWEVER, north styles do have a fair amount of hand techniques. In a real fight or during sparring, we kick perhaps one tenth of the time, which still qualifies as specialization, just not the kind of single-minded kicking that you might expect.